Mango Ginger Minis are a nutritious soy and peanut-free pellet alternative. Spicy taste that appeals to parrots of all species. Made with tangy freeze dried mango powder. These crunchy little squares have intense tropical flavor and the nutrition of fresh mango. KAMUT® Brand flour base - ancient grain offers a nut-like taste and is well tolerated by wheat sensitive birds. Includes beneficial sea kelp which offers anti-fungal and anti-viral properties. Petite size makes Mango Ginger Minis ideal for all small birds, but they are also relished by larger parrots. *Add Mango Ginger Minis to any good quality seed mix or serve on its’ own as a treat. 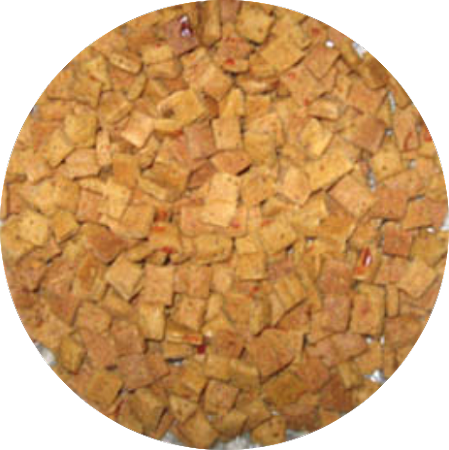 KAMUT® Brand flour, KAMUT® Brand flakes, mango powder, flaxseed meal, coconut oil, chili pepper flakes, ginger, pureed pumpkin, molasses, sea kelp.